Driving up to our lake house the other day I was shocked to see just how many drivers were holding their cellphones and chatting away. Years after handsfree laws went into effect a huge number of drivers are still holding phones and talking. Scary. There is really no excuse for this kind of behavior since every phone now has Bluetooth and good sounding headsets are easy to find and relatively inexpensive. 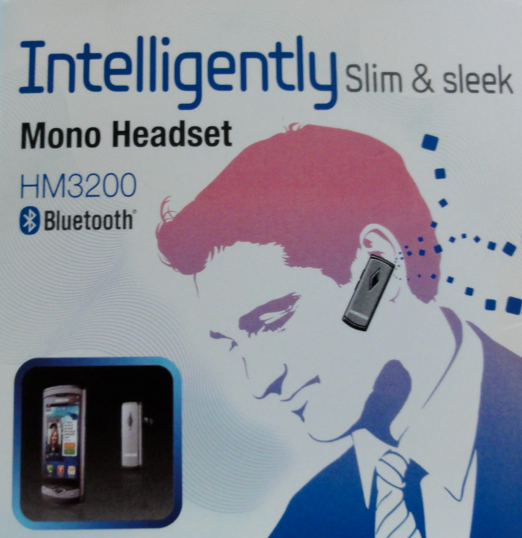 Among the headsets fitting this description are the soon-to-be released Samsung HM3200. I have been using one for the last few weeks. Let’s take a look. Mute and reject function, volume up and down. Five hours of talk time and 180 hours of standby time. The Samsung HM3200 headset features noise reduction and echo cancellation that eliminates unwanted background noise with DSP technology. The company says that this provides a “crystal-clear conversation”. It also features “active paring”. With active pairing the headset will automatically search for and pair with a Bluetooth phone or device that is accessible and within range. This is a far cry from earlier headsets in which the process of pairing was, at best, a difficult process. 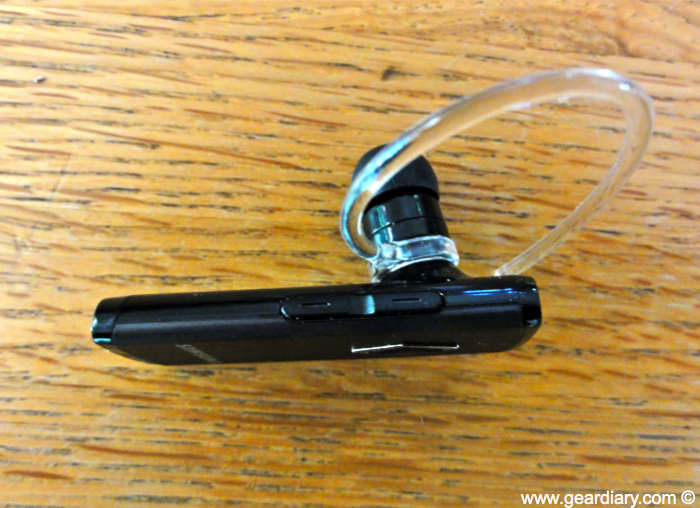 It also features “multipoint technology” which allows for dual connection between the headset and two different mobile phones at the same time. With many of us carrying two phones/communication devices these days a features such as this becomes increasingly useful and important. Thanks to automatic volume adjustment the unit will automatically increase or decrease the volume of the headset depending upon the amount of background noise. Finally it features a battery level indicator so you always know what kind of charge you have available to you. The Samsung headset is similar in design to ones that I have seen from a number of different companies recently but is a bit more stylish. No, actually, it is a lot more stylish. It’s a low profile bar-style headset that is about the same size as the current generation iPod shuffle. It is probably the thinnest headset that I have reviewed.. even thinner than the SoundID and Jabra headset I recently reviewed. Because headsets like this so not have a boom that brings the microphone closer to your mouth it starts off with a distinct disadvantage with regard to the quality of the sound it picks up while wearing it. Fortunately active noise cancellation more than compensates. 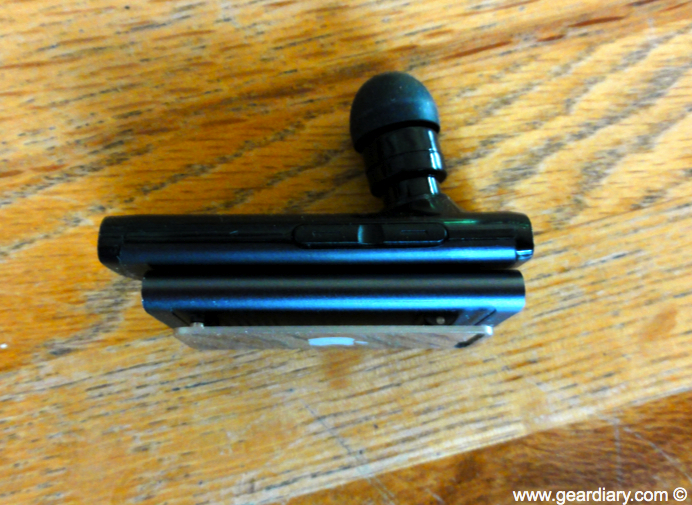 The outside of the headset features the Samsung name and diamond call button. The button is black surrounded with silver . It gives it a distinct, and rather classy look– classy so long as you do not mind the clear Samsung logo that is. The outside portion of the body is a brushed gray metal while the rest of the body is a shiny black plastic. In keeping with the recent trend there is a dedicated on/off button on the headset. In this case it is a push-button rather than the toggle I have seen on other headsets. It is located on the back of the unit so that accidental activation is unlikely. A volume up/down button can be found along the top and a battery indicator is on the bottom. The light glows Blue when the unit has more than an 80% charge, Violet when the charge is between 20 and 80% and Red when the battery dips below 20%. 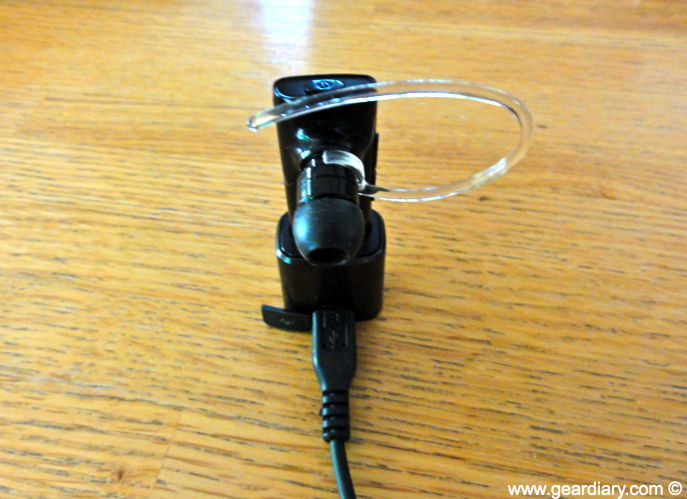 Keeping an eye on the battery charge is extremely important with this headset. More on why in a bit! 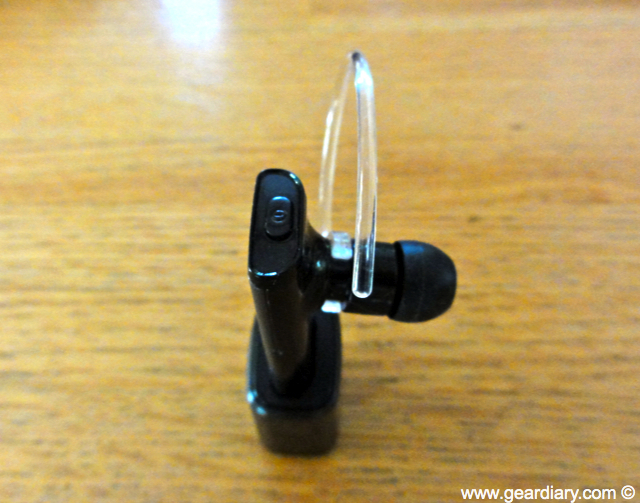 The unit ships with an ear loop but I did find that, thanks to its light weight, it is quite usable without it. This, in turn, makes using the headset for an extended period quite comfortable. The voice quality on the headset was excellent in both directions. I tried it in a number of different circumstances and was told that the conversation sounded as good or better than anything I have used on my iPhone. (My “baseline” for checking out call quality is my assistant Sunny who has “tried out” pretty much every headset I have reviewed with me. She told me she liked the way this headset sounded.) Opening the window, however, was a different story. 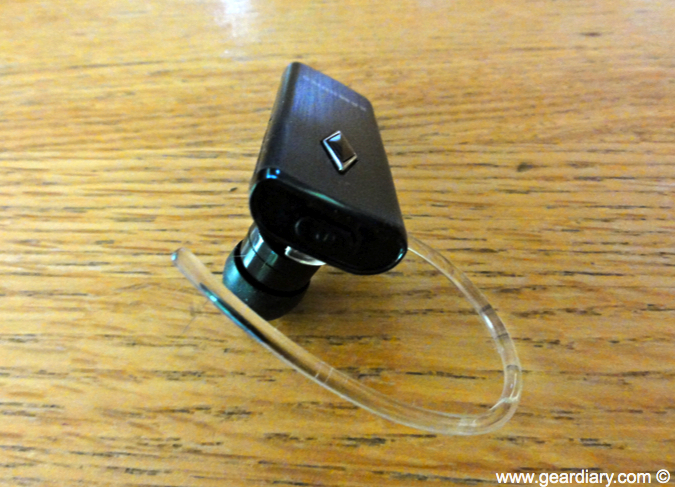 I have used headsets that were ok in high wind (one of the Plantronics headsets I reviewed comes to mind). That was not the case here. 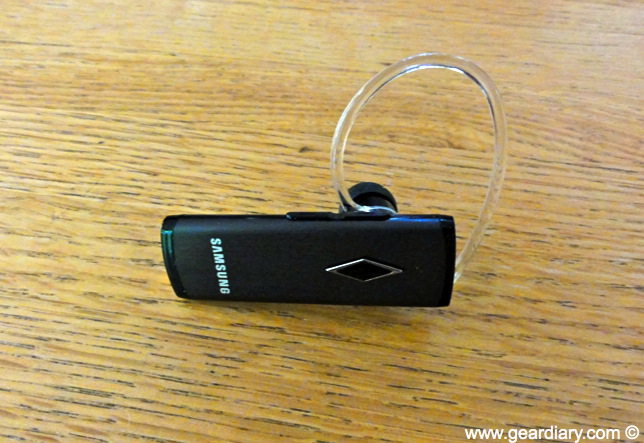 The active noise cancellation works quite well but not well enough to overcome wind noise. Other than that, however, the sound of this headset was excellent. There was one significant downside to this headset which is the only reason for having some degree of reservations regarding recommending it to others. The HM3200 comes with a “charging cradle”. Basically the cradle is a small base into which the headset slips. On the lower back portion of travel adapter is a micro-USB port that the wall adapter or, I assume a car charger, slips into. This allows the unit to be charge and to sit vertically on your desk without having to hold it. It’s a nice little unit that looks great on your desk and let you keep the headset within reach. To use the headset you simply pull up on the headset for holding the charging unit down and headset slips out you can pick up the call. This is where it becomes a problem. If you look closely at the headset you will see that there are two metal connectors on the front and on either side of the microphone. Please make contact with the adapter once slipped inside so that the headset can charge. No problem there as it is a nice combination that looks and feels solid. The problem enters into the picture when you realize that there is no micro USB port on the headset itself. In other words — you can only charge the headset when you have the charging cradle with you. Lose the charging cradle and the headset cannot be charged. Head out on a trip without the charging cradle and — the headset is useless when the charge is used up. 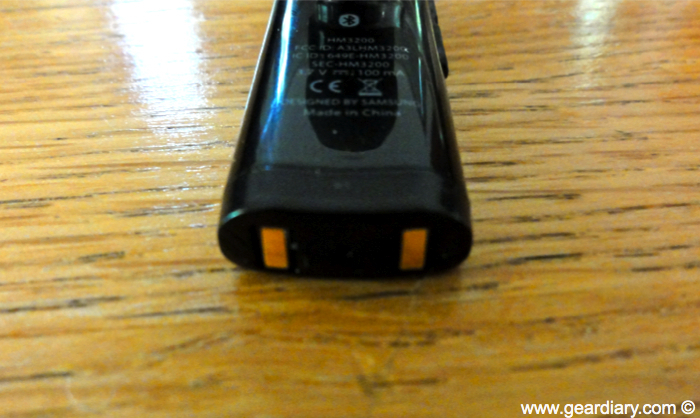 (Hence when keeping an eye on the charge via the LED indicator is so important.) If for whatever reason you do not have or you break the charging cradle the headset itself becomes useless. In my opinion this isn’t a good design decision. Yes, it allows the headset to be super thin and quite stylish but it makes you completely dependent on a charging cradle that is smaller (although much much thicker) than an SD card. When you have the charging cradle it looks and functions perfectly but having to rely on a separate piece of equipment for the headset for work — let alone something as small as this… that would worry me. Is this a dealbreaker for me? No! but it is something about which you should be aware. I find headset to be quite comfortable and the sound quality to be excellent. The lack of the ability to directly charge it doesn’t complete undo those positives but it is reason for pause. I would have far less of a concern if Samsung thought to include two or three of these charging cradles so I could keep one on my desk at home and one either in the car or on my desk at work. As it stands now, however, if I leave the charging cradle at home I had better hope I talk less that its charge allows before the day is out. 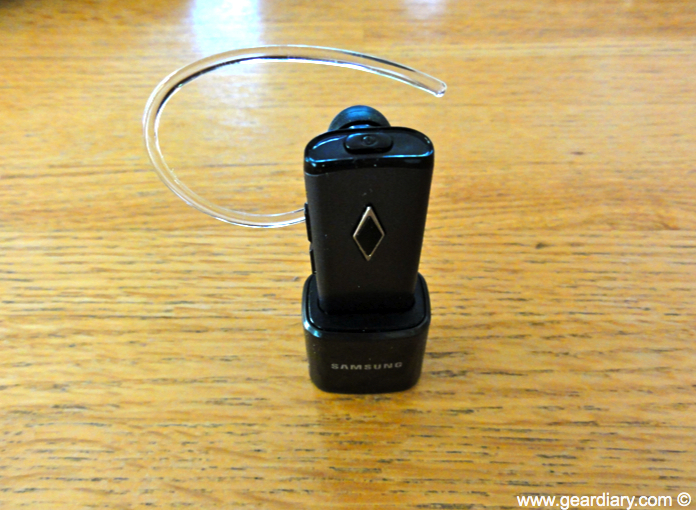 The Samsung HM3200 Bluetooth Headset should be available soon for an MSRP in the neighborhood of $60. We’ll let you know when it is released.